Japanese travelers have long dominated the duty free shops for foreign tourists. However, this dominance has waned and Japanese are on course to be overtaken soon by Chinese tourists. Lotte Duty Free, the nation’s largest duty free seller operated by Hotel Lotte, said its sales to Chinese customers almost doubled from 8.9 percent to 16 percent this year amid a slight decrease in those to Japanese. When it came to its outlet on Jeju Island, Lotte said, Chinese sales made up almost 80 percent of the total, exceeding that of Japanese for the first time this year. 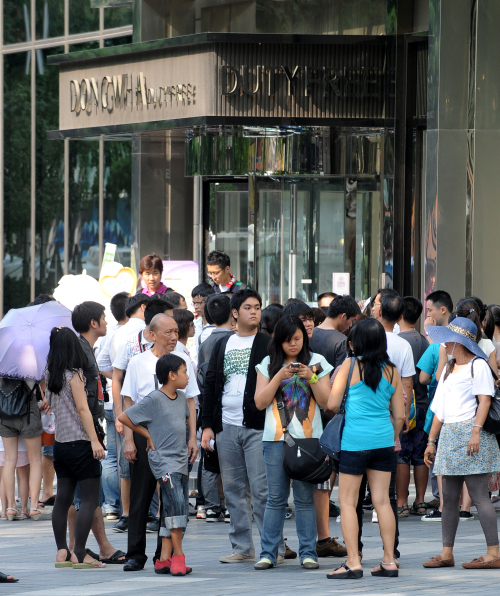 More Chinese people with purchasing power traveled Korea this year than ever brfore, especially during the Chinese “golden week” of Oct. 1-7. When some 12,000 employees at China’s Baozhen Group visited through an incentive tourism program, a Lotte duty free shop in central Seoul posted its highest-ever daily sales figure of 4.59 billion won ($3.96 million) on Sept. 18. “If this trend continues, Chinese spending will surpass that of Japanese soon,” said a Lotte official. The official, however, predicted that the strong yen could boost the spending of Japanese travelers again next year. Shilla Duty Free, the second-largest duty free chain operated by Hotel Shilla, also said the ratio for Chinese and Japanese customers has narrowed this year. Until 2009, Japanese sales at Shilla almost tripled that of Chinese. However, the ratio for Chinese is fast growing to reach 46.9 percent this year compared to the Japanese figure of 53.1 percent, the retailer said. “When the Baozhen group visited in the autumn season, Chinese spending had exceeded that of Japanese for a short time,” said a Shilla official. According to the Korea Tourism Organization, more than 8 million foreign nationals, including 2.65 million Japanese and 1.88 Chinese travelers, have visited Korea as of October. Amid a 5.6 percent increase in Japanese, Chinese tourists surged with a 16.5 percent growth from a year earlier. Despite their smaller number, sources said, Chinese travelers spend big on luxury goods such as cosmetics and designer bags, while Japanese preferred cheaper items such as seasoned laver and snacks.